Complete the function provided for you in your editor. 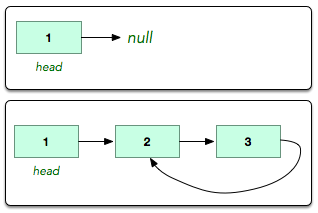 It has one parameter: a pointer to a Node object named that points to the head of a linked list. Your function must return a boolean denoting whether or not there is a cycle in the list. If there is a cycle, return true; otherwise, return false. Note: If the list is empty, will be null. Our hidden code checker passes the appropriate argument to your function. You are not responsible for reading any input from stdin. If the list contains a cycle, your function must return true. If the list does not contain a cycle, it must return false. The binary integer corresponding to the boolean value returned by your function is printed to stdout by our hidden code checker. The first list has no cycle, so we return false and the hidden code checker prints to stdout. The second list has a cycle, so we return true and the hidden code checker prints to stdout.